This one is all about my nails, how I care for them, what I do to them, and about my journey of growing them out. Firstly, I'll start with the journey of growing my nails out - as that's how I discovered these magical products that are now my holy grail products, and that I have repurchased several times and, shall continue to do so. I do believe that It is only due to these products that I have long nails now. I have repurchased this Sally Hansen Maximum Strength countless times now! I have recommended it to several people and also blogged about it too. This was the first treatment I tried. Although, the first time I used it I didn't like it - only because I didn't use it properly! It's a weekly treatment and to use it, you apply 1-2 coats on bare nails on day one, then apply another coat ontop everyday for a week. 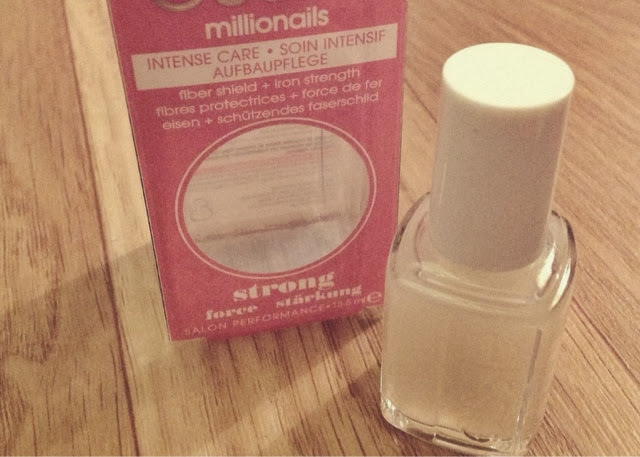 It makes your nails really strong and hard, also I painted over the nail on the 7th day, it was so thick that it made them look like gel nails! The Sally Hansen is a deeper and more concentrated treatment then the Essie Millionails which I have moved onto now. I use this one now because I don't feel like my nails need such a deep treatment, they're strong on their own now and I just use the Essie to maintain that. To use it I apply 1-2 coats onto the bare nail as a base coat then apply a colour and then use it as a top coat as well. I find that it works really well on helping to maintain the nails strength but I wouldn't say it's as good a treatment as the Sally Hansen product.